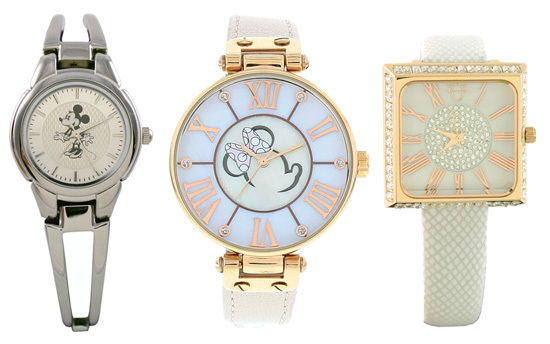 This Week the elegant look of the three watches pictured at the top of this article. 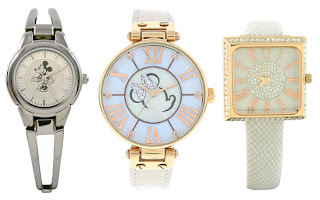 These watches were recently introduced for the spring season, one of two seasons that the timepiece development team likes to introduce new items. 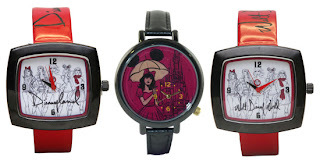 For spring, the timepiece development team enlisted the help of Disney Design Group artists to create new watches. Artist Tim Whalen created two new designs based on T-shirts from Disney Parks. You may remember seeing the shirt with the girl holding the Mickey Mouse umbrella in Michelle Stepney’s Disney Style Snapshot from early April. Some Moms may love Disney Villains may enjoy three new watches created by Disney Design Group artists Mark Seppala and Darren Wilson. 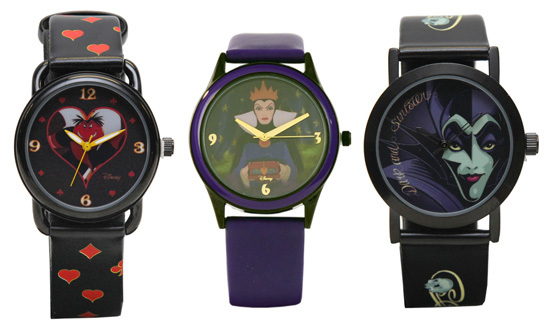 Mark, whom you may recall from Disney Ear Hat fame, designed the watches featuring the Queen of Hearts and the Queen from “Snow White and the Seven Dwarfs,” while Darren created the amazing Maleficent watch. In Florida, look for these watches at Tren-D and the World of Disney store in Downtown Disney Marketplace. 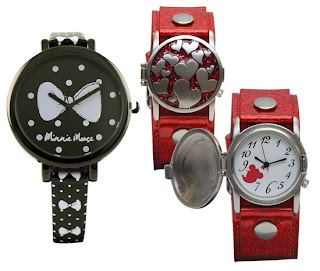 In California, you can find timepieces in the World of Disney store in the Downtown Disney District as well as the Fortuosity Shop inside Disneyland park. Select watches can also be found on the Disney Parks online store. Finally, to further the magic on Mother’s Day, Sunday, May 12, Disney Parks will honor all moms with a special flower when she visits any of the theme parks at Disneyland and Walt Disney World Resorts (please note that valid theme park admission is required).